Like its art, language and cultural heritage, Chiang Mai cuisine is distinct from its cousins to the south and east. 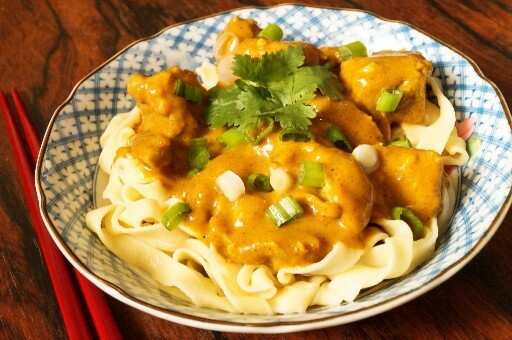 A much more pronounced influence from Burma and China is evident in northern food, resulting in milder curries and the heavier use of ginger and turmeric. Khao Niao (sticky rice), instead of steamed rice, is the main staple at every meal and goes very well with a range of nam prik (chilli dips) unique to Chiang Mai cuisine. Rich and savoury yellow curry noodle soup, served with spring onions, pickled cabbage and slices of lime. 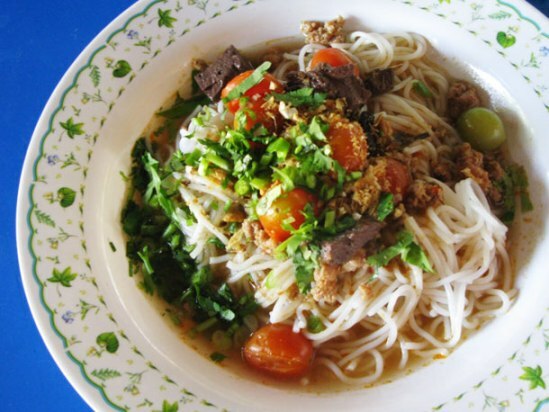 The egg noodles are of the flat variety, with a small handful of deep-fried portion added on top and also crushed into the broth for a toothsome texture. 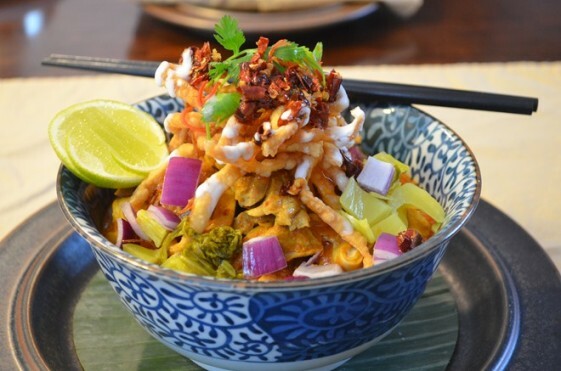 Choose from chicken, pork, or beef Khao Soi. Usually the portion is quite small, so you might end up ordering another bowl to fill up the stomach. Not a single dish but a signature Lanna dining/ Chiang Mai cusine experience. 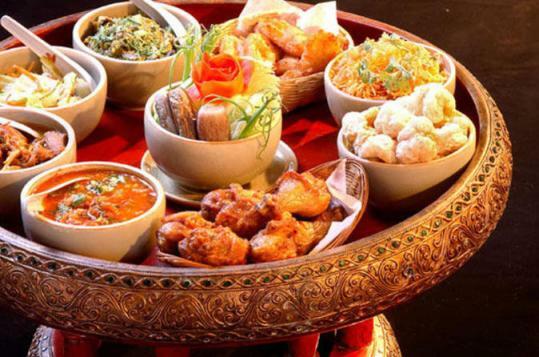 Served in a low teak tray that doubles as a table, the khan toke comprises a range of northern-style side dishes and a basket of sticky rice. Diners sit on the floor, and dig in with one hand. The modern version of khan toke is accompanied by a series of cultural performances such as folk music, finger-nail dance and tribal dances. A fiery starter dish, sai oua is northern-style sausage made from ground pork, dried chilies, garlic, shallots and a range of pungent herbs and spices. 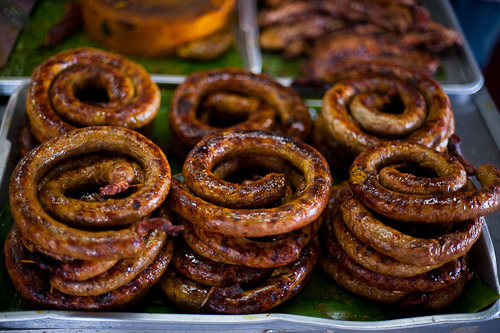 It looks very similar to northeastern-style sausage when seen on a charcoal grill but tastes drastically different – sai oua is more meaty and rich with herbal aromas as well as chilies. This green and red chilli dip duo is the most well-known among all the northern-style chilli dips. Made with roasted chilli spur peppers, the chilli dip, or nam prik nume, is fiery and will leave your tongue burning after only the first bite. 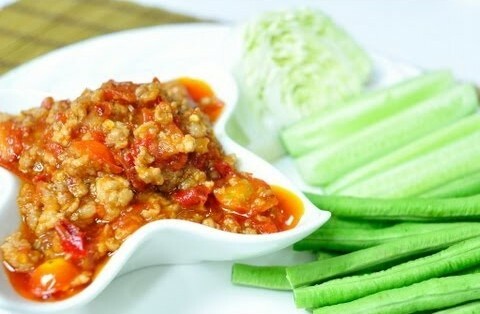 The red chilli dip, or nam prik ong, tastes slightly milder, with a tomato-based paste mixed with ground pork, chopped coriander, spring onion and dried bird’s eye chilies. Both are usually eaten with crispy pork skin, steamed vegetables, or sticky rice. A yellow curry with a tamarind-based soup, pork chunks, shallots and shrimp paste. Its origins are in Burma, but the adapted northern Thai version uses less oil. With no coconut cream as the ingredient, the texture is less thick than green curry and rich with spices. Some might find gaeng hang lay an acquired taste. Perhaps the most exotic looking among all the kanom jeen (spaghetti-like noodles), this dish in Chiang Mai consists of the kanom jeen in a pork-soybean curry (nam ngeow), served with fresh vegetables, kaeb moo (crispy pork skin), dried bird’s eye chilies and a range of local condiments. The soup tastes rather light and refreshing, unlike other coconut cream versions found in other regional kanom jeen dishes. Refreshingly spicy, nutty and flavoursome, this healthy dish will wake you up from any slumber. The young jackfruit is boiled until tender, then shredded and stir-fried with a garlic-dried chilli-shrimp paste base and a handful of herbs. Take one bite and the rich sweet, sour, salty and nutty tastes will explode in the mouth. Larb in the north area of Thailand has more spices in it than the northeastern version. 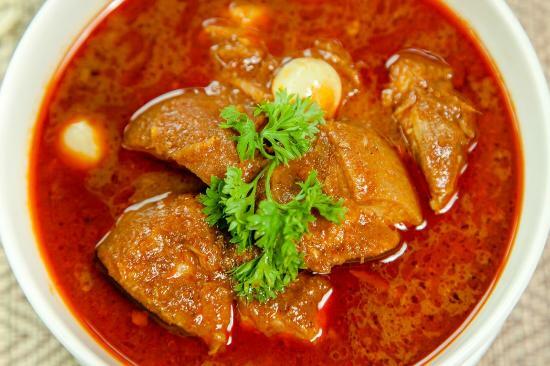 Beef, fish, pork or chicken meat is chopped up together with blood chunks and innards, then a quick stir in heated cooking oil (oil roasting), along with dried chilies, larb curry, blood chunks and a handful of herbs and spices. The dish goes with warm sticky rice. 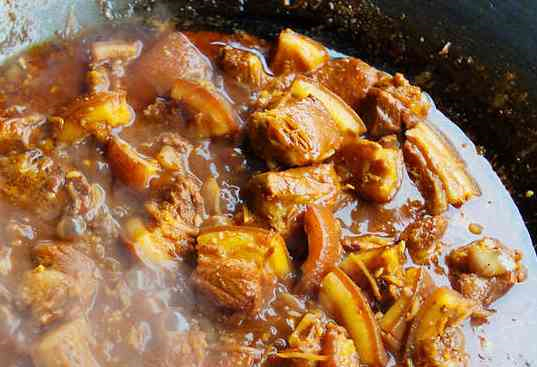 The name means ‘all mixed up’, and that’s what this dry curry dish is all about. Traditionally fashioned from kitchen leftovers, Gaeng Ho today is usually made from fresh ingredients. Fermented bamboo shoot, red curry paste, hang lay curry paste and kae curry paste combine to make the base ingredients. These then are mixed with a good variety of herbs and vegetables, pork belly meat, glass noodle, shrimp paste and chilies. Bags of kalamae for sale at Savoey, the oldest kalamae shop in Chiang Mai. Wrapping up the Warorot trinity of greats is something for the sweet tooth, although denture wearers might want to stay away. The Thai-Mon dessert kalamae has a caramel-like chewiness to it. Made from molasses, sticky rice and coconut milk, these treats were traditionally only made for special occasions such as New Year, bringing together entire villages to pitch in and help with the arduous mixing process. Savoey at Kad Luang carries sesame seed-coated bites wrapped in nipa palm leaves as well as red, green, black and brown gummies wrapped in clear cellophane. Each color represents one flavor (green for pandanus, brown for durian), but the slight taste differences and the rate these soft chewies are easily eaten mean the nuances are barely noticeable. 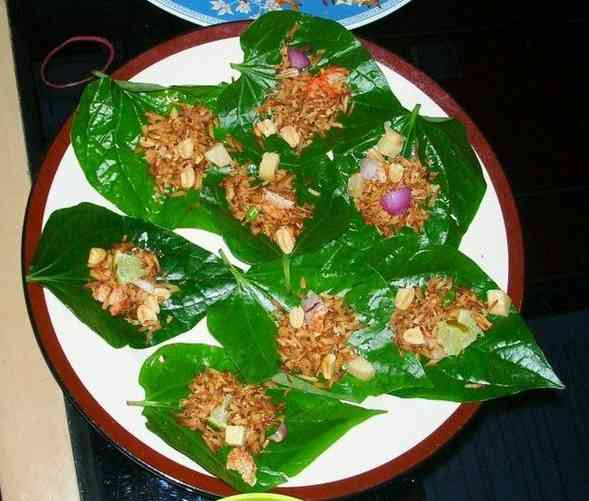 Miang Kham literally translates to ‘eating many things in one bite’ and is sort of the perfect food to get a taste of northern Thai food. Create your very own snacks by mixing spicy, sour, sweet and salty ingredients such as peanuts, ginger, chillies, shallots, mango and onions and wrap those in a Cha Plu leaf (similar to betel). Aside from restaurants, it’s also available on markets, however pre-wrapped. Kaeng Hang Lei – or Burmese Curry, how locals call it – reminds pretty much of a stew and consists of a sauce made from a blend of several spices such as ginger, tamarind, turmeric and garlic. The main ingredient however is a chunk of pork belly. Kaeng Hang Lei is yet another popular curry dish, but usually not as spicy as the above mentioned Khao Soi.